It is within your power to live your life on your own terms – one small daily step at a time. For most people the single biggest hurdle is having reliable, durable income that they completely control and that is more than enough to fund the lifestyle they want. Having an independent source of income that is online and portable is one of the most liberating circumstances you can imagine. After nearly twenty years of living this way and telling people about it, there are two very common reasons I hear from people about why they aren’t doing it too. Those two things cover about 90% of excuses people tell me. What’s frustrating to me is that neither of those two common excuses is actually legit. It’s not that people aren’t 100% sincere in what they are saying. They are! It’s that they are mistaken, because they are making false assumptions and don’t realize it. 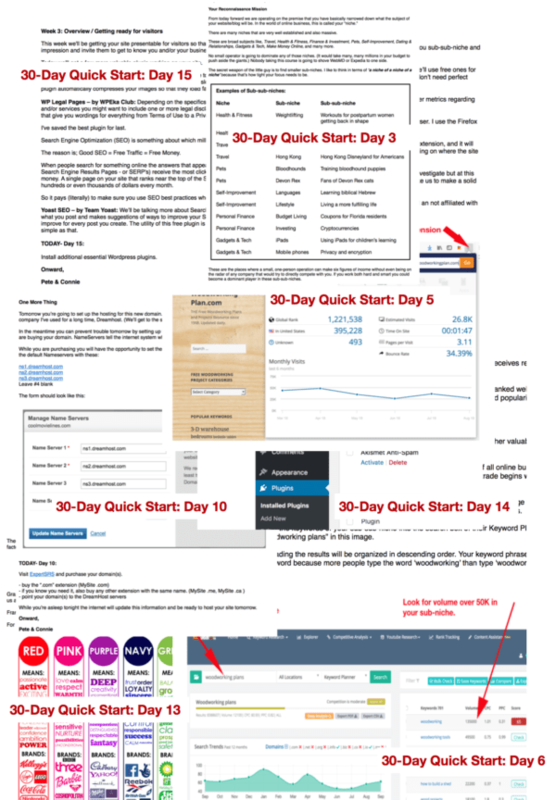 I guess I just heard those two mistaken assumptions once too often because it spurred me to create a complete 30-day email course that answers both issues. 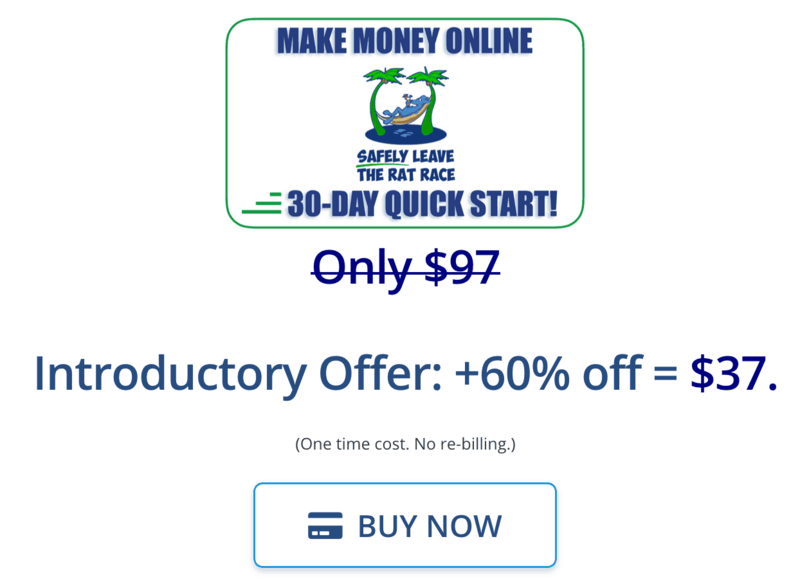 The 30-Day Quick Start course delivers a small task to your in-box each day for 30 days. Each day’s task is easily achievable on that day. Each step is arranged in a logical sequence so that it builds upon previous steps. In just the first week you will be able to choose what I call a ‘sub-sub-niche’ that is suited to your life experience, personality, and personal interests. Even better, I’ll show you exactly where to find unbiased proof – from different sources – that your preferred sub-sub-niche is profitable and that people just like you are already making good money in that sub-sub-niche. That’s just in the first seven days! Every day you’ll receive an email with a single element that needs to be addressed. Some will just take a few minutes, some might take you a couple of hours, and a few are just important things to be thinking about until the next day. The whole course is designed to completely eliminate the feeling of being overwhelmed. It’s also designed to keep you focused on a specific thing and avoid all the distractions. That’s critical for many people. The steps are done in order, but you have total flexibility in how long you actually take to complete this course. Depending on your personal schedule you might file away each email then take 40, 60, 90 days or whatever you need to get through them. But each step systematically moves you a little closer to your goal. you will have everything you need to continue building your audience at whatever pace you can manage according to your personal schedule and motivation. All the above might seem impossible to accomplish in only 30 days. But when it’s broken down into discrete steps it’s achievable even by a complete beginner. In just 30 days you will have what you need to build your own ready audience of perfectly targeted people who will come to know, appreciate, and trust you. Later, these people will be your first customers and will be eager to send you their money when you to move to the monetizing phase of your online business. And you’ll be doing all of this in a sub-sub-niche that interests you, plays to your personal strengths, and that you have verified to be profitable. You’ll also see that you really can afford to start building your own online business. Because if you can afford the computer or even the smart phone you are reading this on you can easily afford the components of a functioning, versatile online business. As you work through the daily emails you’ll feel a shift in your mindset and the way your innate creative problem solving abilities begin to open the floodgates of a new perspective. If you’ve read this far you already know you’ve wanted to build your own online business for a long time. Only you can take the first step. This is my best shot at getting you started on the right path. Step by step, a day at a time. Our business model relies on beneficial, long term relationships. Like everything else I do, I personally guarantee you will enjoy this email course and be very happy you bought it.